La Salle, shown here celebrating an earlier victory, returned to the 3A Pennsylvania Cup championship for the first time since 2016. Sam Lipkin had a hat trick for La Salle, and Matt Owens had one for West Chester Rustin on Saturday as the Explorers and Golden Knights won their respective Pennsylvania Cup state championship games at Robert Morris University’s Island Sports Center in Pittsburgh. 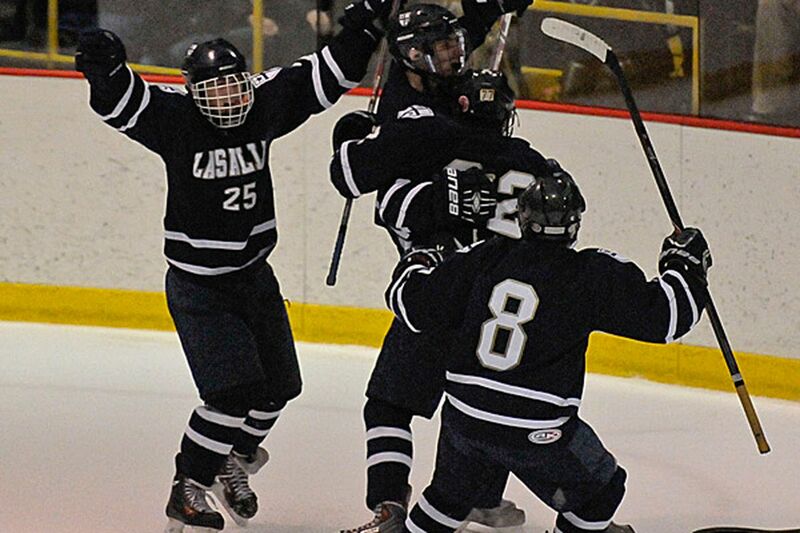 La Salle scored three goals in the third period to beat North Allegheny, 6-3, in the Class 3A championship. Lipkin scored short-handed to break the tie in the third period and netted his third goal about eight minutes later to give the Explorers a two-goal lead. Lipkin also assisted on one of Michael Casey’s two goals. Daniel Sambuco had a four-point game for the Explorers with one goal and three assists. Rustin won its sixth straight Class A Pennsylvania Cup title by beating Montour, 11-3. The Golden Knights scored the first six goals of the game and led 4-0 after the first period. Rustin’s Nicholas Ferraro had one goal and four assists, while Owens added an assist to his hat trick. Goalie Joel Keller stopped 29 of the 32 shots he faced. In the Class 2A game, Downingtown East could not win its third straight title, falling, 3-0, to Pine-Richland. Goalie Daniel Stauffer made 24 saves for Pine-Richland. The Rams scored a goal in each period and held the Cougars to 0-for-3 on the power play. The Pennsylvania Cup pit the winners of the Flyers Cup tournament against the winners of the Penguins Cup tournament. The 40th annual Flyers Cup tournament, held over four weeks this month, featured 52 teams separated into A, 2A, 3A, New Jersey, Delaware and girls’ brackets competing for titles, with the A, 2A and 3A champions facing Western Pennsylvania’s best. La Salle returned to the 3A Pennsylvania Cup championship for the first time since 2016 by beating St. Joseph’s Prep, 5-2, last Sunday at the Wells Fargo Center. The Explorers had the top seed in the tournament and earned a first-round bye, but they nearly lost in the semifinals. Holy Ghost Prep held a 2-0 lead over La Salle after two periods on March 14 before the Explorers scored five third-period goals in their 5-4 win. Casey had four assists against Holy Ghost Prep and led the Explorers with three points in the Flyers Cup championship game. Downingtown East beat rival Downingtown West, 7-2, last Sunday to win the Class 2A Flyers Cup and earn a chance to three-peat. East took a 2-1 lead after the first period then outscored West, 3-0, in the second period. Ryan Prestayko scored four goals in the Cougars’ victory, while Andrew Ceglia, Theo Vela, Nicholas Rosati and Michael Bolger all had multi-point games. Downingtown East held each of its first two opponents, Council Rock South and Parkland, to just 14 shots on goal. In the semifinals, Rosati, Bolger and Ryan Johnston scored in Downingtown East’s 3-2 win over Pennridge. Rustin won the Class A Flyers Cup last Sunday for the sixth straight year. The Golden Knights beat Hershey, 5-1, behind two goals and one assist from Owens and 26 saves by Keller. During the Flyers Cup, the Golden Knights went 6-for-10 on the power play, including 4-for-6 in its 7-2 semifinal win over West Chester East. Ferraro scored two of his three goals on the power play and tallied a power-play assist. Rustin scored at least five goals in all of its Flyers Cup games, including a 13-0 win over Sun Valley and a 12-0 win over Lower Merion. Owens had a five-point game, including a hat-trick, against Sun Valley. Ferraro scored two goals and had three assists against Lower Merion. In the girls’ Flyers Cup tournament, West Chester Rustin beat West Chester East in the first round, and Unionville beat Rustin to win the championship last Sunday. Unionville won its fifth consecutive title. Mattie Robitzer made 26 saves in Unionville’s 5-0 win over the Golden Knights. Lily Robitzer, Lucy Brucker and Katarina Tuerff each had two points. Tuerff scored twice in the third period.